You can now subscribe to The Good Catholic Life in iTunes. With a subscription, your computer automatically will download each episode of the program after it’s available and then you can listen at your computer or on your iPod, iPhone or iPad on the go, wherever you are. Each episode will be available for downloading a few hours after broadcast usually, although we can’t guarantee exactly when iTunes will display it. When you subscribe and listen, please return to the iTunes page and write a nice review, if you like our program. 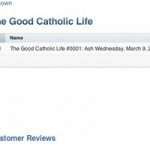 Good reviews encourage other listeners to subscribe and promote The Good Catholic Life to a wider audience. We appreciate your support.